I want the unobtainable. Other artists paint a bridge, a house, a boat, and that’s the end. I want to paint the air which surrounds the bridge, the house, the boat, the beauty of the air in which these objects are located, and that is nothing short of impossible. I’ve come across a book that I’d like to share with you. A science book that has some pertinent lessons for those working in BIM – or seriously considering doing so. 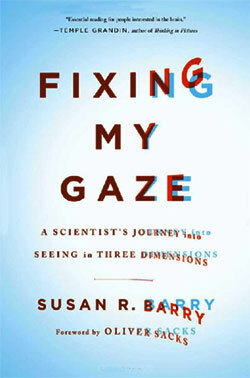 In Fixing My Gaze: A Scientist’s Journey into Seeing in Three Dimensions, by Susan R. Barry with a foreword by Oliver Sacks, Barry describes how miraculous it is after 50 years to suddenly be able to see in 3D for the first time. The memoir is a fascinating account of Sue Barry’s acquisition of stereo-vision at an adult age. In the book she reveals step-by-step how this new 3D world was revealed to her. And shows how her experiences are not, in the end, unique. Barry, a neuroscientist, was born with her eyes crossed and literally couldn’t see in all three dimensions. The author, a professor of Neuroscience, remained unable to see in 3D for most of her life. She was missing depth perception, that visual ability to judge what is closer and farther away. Everything appeared flat to her. Snow, for example, would appear to fall in a flat sheet in one plane in front of her. Barry tells the story of how she was able to learn from others how to successfully correct her vision as an adult. And how she recovered depth perception when she was 50 after visual therapy with a developmental optometrist. In her late 40’s Barry was referred to an Optometrist not far from the University where she taught and did research. The Optometrist evaluated her and determined that with a prescribed program of vision therapy, Barry might gain binocular vision. After some hard work, Sue Barry was able to see in 3D. The book asks and answers: If deliberate effort can rewire sensory processing at 50, what other astounding feats might our brain manage with the right training? Read Fixing My Gaze if interested in learning how the brain can adapt and change at any stage of life due to the plasticity of the brain through training. The story of “Stereo Sue” regaining her depth perception at age 50 and astonishing the medical community was first told in a 2006 article by Oliver Sacks in the New Yorker. Hear Sue’s story on NPR Morning Edition. Or read on for 11 LESSONS that can be extracted from the inspiring book. Lesson 1: While working in 2D made us all bystanders, working in BIM puts you in the middle of things. In the book, a visit to Manhattan surprises Barry with skyscrapers that no longer appear as a flat backdrop. Before acquiring 3D vision, Barry’s 2D existence felt as though she was looking into a snowfall. From the outside. On the outside, looking in. Whereas once she trained herself to think in 3D, she felt herself to be within the snowfall, among the flakes. She found herself surrounded by and immersed in life. Working in BIM once again makes us participants in the design and construction process. Appreciate the many ways that BIM allows us to see things that we were formally unable – or unwilling – to see. It’s not for nothing that our projects are located on a site. The book teaches us that Sue, like many others, who want to experience their worlds in 3D find ways to work around their uncoordinated vision. The brain does amazing things to compensate for visual deficiencies and retraining shows what’s possible. Just like those of us working in BIM, by coming up with makeshift, piecemeal workarounds. To say BIM is just a tool is like saying the eye is just a tool. It’s the profane, rational thing to say. When you take in their complexity and all that they can accomplish – it is easy to see that both the eye and BIM are more than tools. We ought to treat them that way. Barry says that those with 2D vision and those with 3D vision speak different languages. BIM and sight are processes – not singular things. The more dimensions we afford them, the easier this is to see. As with the three-letter acronym BIM, the three-letter word “fix” has many definitions. To restore by replacing a part or putting together what is torn or broken. The implication is that we’re broken in some way and we need repair. There’s a great deal in our profession and industry that requires fixing. Your role working in BIM is to fix what doesn’t work. Don’t limit yourself to just one dimension or definition of what it means to work in BIM. There’s the common use of fix to prepare or cook, as well as to situate: put something, somewhere firmly. To fasten, to firmly attach, as to a cause. But to fix can mean to fix our gaze. To set it, stop it, position it. Like the Far Side Cartoon of the car side mirror filled with the huge bug eye with the caption that read: Objects in the mirror appear further than they actually are. In transforming ourselves from 2D to 3D – from thinking in 3D to communicating in 3D – and with it the attendant realities, there’s no more faking it – in BIM there’s nowhere to hide. Our models are warts-and-all stories. Closer to reality than to fantasy, threatening to our associative sensibilities. If author Barry could acquire stereo-vision – the ability to see in 3D – so can you, no matter your role or career position. Those of us brought up on 2D CAD are committing to fixing our gaze and acquiring stereo-vision. Going from analog-vision of hand drawing and mono-vision of 2D to stereo-vision of working in 3D. The book tells a story of perseverance in overcoming obstacles. Obstacles we all must overcome in moving from 2D documentation to 3D design and virtual construction. Like the author, find and identify success stories of your own. Barry had to learn to see in 3D, something that most of us take for granted. We as design professionals and those working in the construction industry suffered from our own lack of depth perception. In that we’re not looking at our tools deeply enough. By viscerally identifying with her 2D life and appreciating her 3D discoveries, as readers we’re able to understand a little of the 3D world to which we’re currently blind. As with Flatland, many of us still find ourselves seeing in only 2 dimensions, as though we were stuck in CAD. Ask yourself: When did you first realize that you couldn’t see in 3D? Architects see in 3D from near the beginning of their careers. What they don’t necessarily do is work in 3D. You have advantages others do not have and take these for granted. The book covers the science behind our vision, particularly how it is that we see in three dimensions. Science that we take for granted. If you have acquired the software. If you have implemented BIM. If you have mastered it. Take a moment now to honor yourself. You have accomplished something great and profound. Something that will not only help you, your firm, the contractor and owner but also the profession and industry. When you learn to work in BIM you are helping others achieve their goals. Mastering BIM – as you help yourself – you are helping others. From the time of the Renaissance, artists have made use of tricks and cues to create a sense of depth to endow their art work with a sense of life.As BIM endows a stalled profession with a sense of life. Working in 3D ought to invigorate our senses and shake up our composure. Professor Barry’s renaissance with her newfound abilities will motivate you to be a serious student again in all it is you still have to learn. Working in architecture becomes exciting again. Give yourself the gift of depth perception. Once, seeing – and working – in 2D was all we knew. The equivalent of working in little bim without taking the additional dimensional leap into BIG BIM. Working in BIM completes us as design professionals. BIM is the quality that gives the architect dimensionality. Design plus construction. Tool plus process. BIM plus IPD. Look for that hidden wholeness. Perception is not something that happens to us, or in us. It is something that we do. Today the 3D world of BIM is revealed to us in myriad ways. In articles, webinars, classes, training sessions, in blogs, in books, in the office. But knowing BIM is not enough. Sue, a neuroscientist, knew practically everything there was to know about seeing in 3D or stereopsis, but her world and joy of seeing changed profoundly when she experienced 3D vision. Knowledge of BIM is not enough – you have to experience it for yourself.